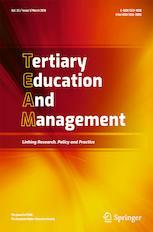 Tertiary Education and Management (TEAM), the journal of EAIR – The European Higher Education Society, is an international peer-reviewed journal intended to create a better linkage of research, policy and practice in teaching and learning as well as in higher education management, governance and organisation. Being an interdisciplinary and international orientated journal, TEAM welcomes research contributions that reflect upon, study or question main developmental trends and practices, and address current and future challenges in higher education. Articles submitted should as a consequence be written for, understood by, and be relevant for a multicultural, multifaceted and international audience. TEAM welcomes articles using a variety of approaches, methods and perspectives given that the article demonstrate the relevance of the research in a broader context whether this be in other higher education institutions, other national settings or in the international arena. Occasionally, the journal also publishes articles where personal viewpoints/experiences or political arguments are made to stimulate discussion and reflection, or to challenge established thinking in the field of higher education. Such pieces are published in a dedicated "Forum" section of the journal.